The American sweet gum, Liquidambar styraciflua‘Worplesdon,’stands as a brilliant autumnal beacon beside the lake. The genus Liquidambar occurs in Asia and North America. 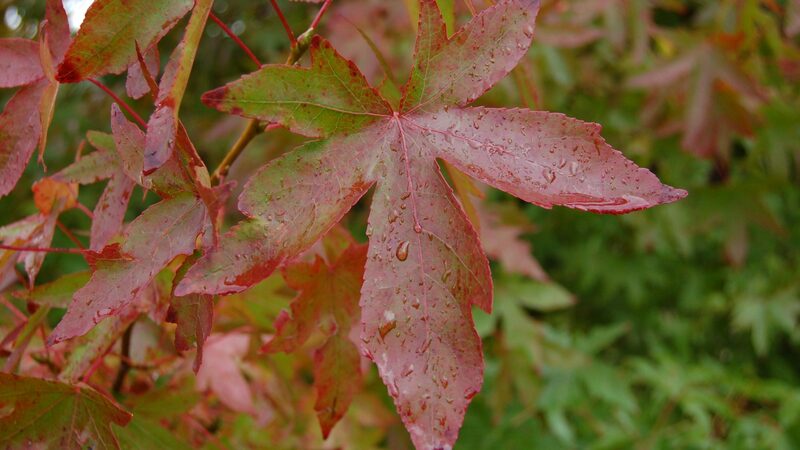 Each species has palmate, lobed, maple-like leaves, which can provide autumn colour. Belonging to the witch hazel family, Hamamelidaceae, the greenish-yellow flowers are borne on globose heads, each bearing either male or female flowers. The female flower heads develop to produce spiky fruit clusters. Liquidambar styraciflua ‘Worplesdon’ is a selection of this North American species. In the wild it grows in damp, and even swampy, conditions. The timber of this species is known as satin walnut, and is used for cabinet-making. The common name, sweet gum, refers to the fragrant, sticky resin produced by the tree.